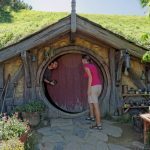 In this post there will be not many photos and some of them come from the internet. Why this post will be different from the others? Because the people, that we want to tell you about, asked us to respect their privacy and traditions. This will be “only” a description of our meeting and time spent with indigenous people of Canada – First Nations. We dedicate this post to Robert, who told us about his dream to smoke a pipe with Indians. We thank you for the inspiration! Before we set off on a journey around the world have heard different stories about Indians in Canada. The term “First Nations” describes aboriginal people who have the status of “Indians” and part of the population not having the status of “Indians” but identifiyng themselves as natives of Canada while not being Inuit or Metis. Currently, there’s 617 “First Nations”, representing more than 50 different cultural groups and nationalities living in Canada. 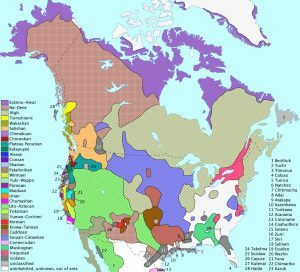 Among this group we can distinguish more than 50 different languages that are used by the indigenous people of Canada. 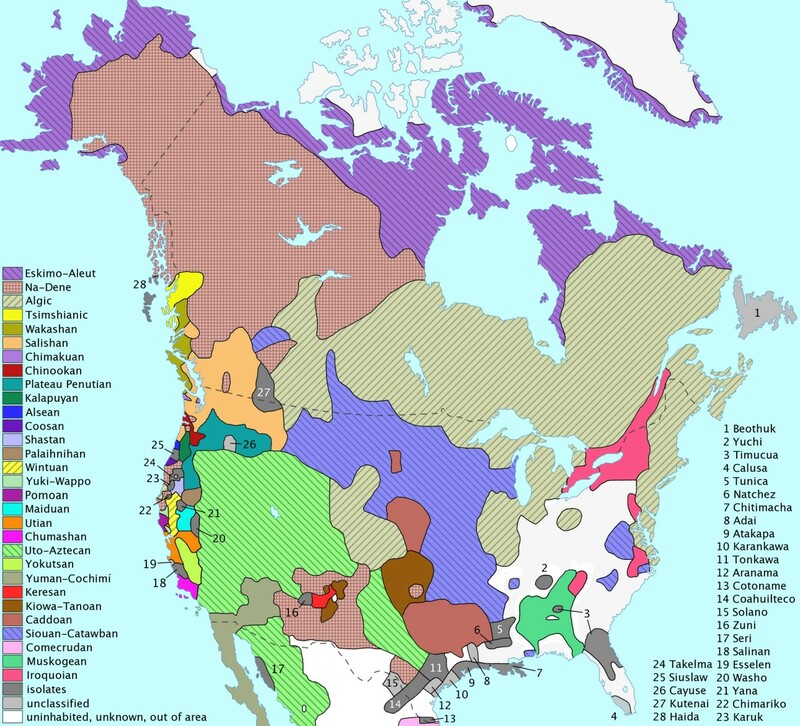 Map of languages in North America before European colonization. Research conducted in 2011 shows that 1.4 million people in Canada belongs to different groups identifying themselves as indigigenous people (with 65% being First Nations, 30% Metis, 4% Inuit). 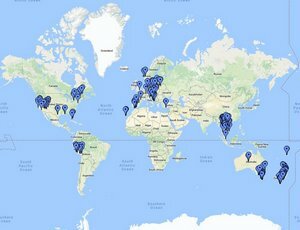 Half of this group lives in urban centers, while the rest cultivates tradition in more remote places. As we wrote in the post about Quebec City – we went to see the whales as Benoit suggested us to do. 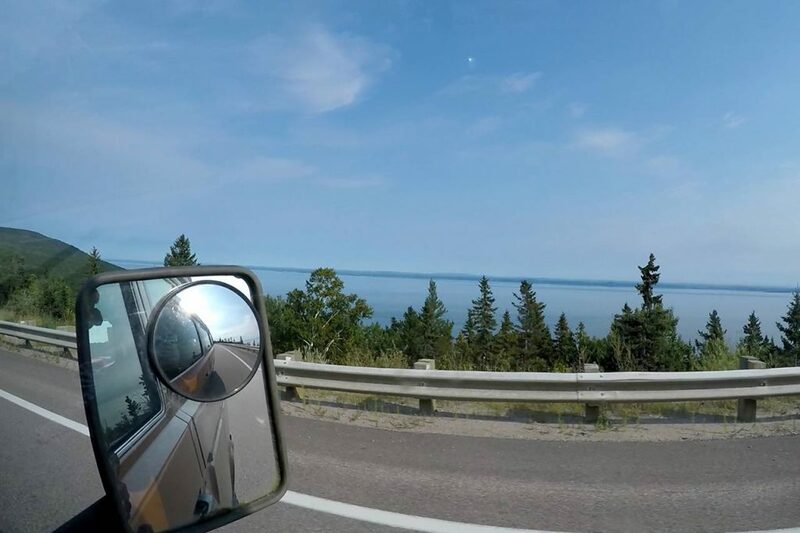 The cheapest option to get to Tadoussac was Kangaride, which is the Canadian service for carpooling. 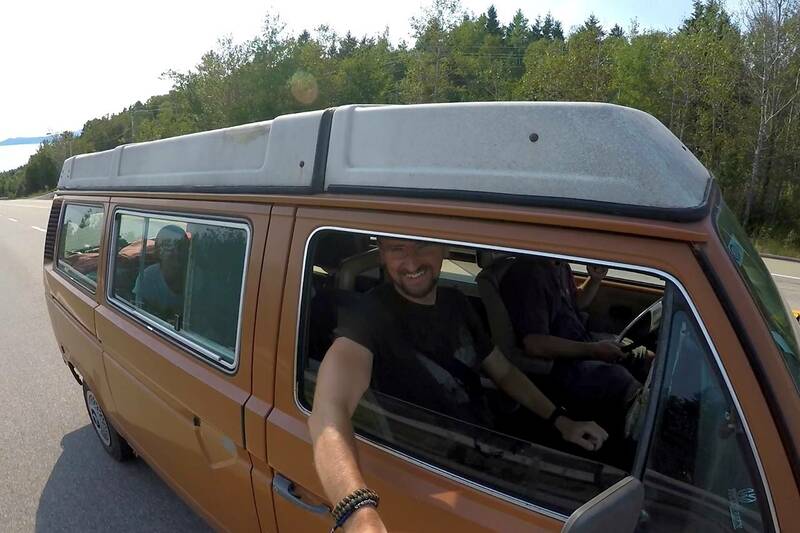 When we arrived to the meeting place, we started laughing when we saw that our ride was 5 years older than us VW Westfalia. After a short chit-chat with the driver we learned that Tadoussac is only a short stop on his route. He was travelling to a Canadian Indian village where they will have an important ceremony, completely inaccessible to the public. A trip in VW Westfalia. We could not quite believe what we heard. From the beginning of our trip to Canada, we were looking for information on where we could meet the Indians in their village or in the reserve and no one was able to help us. And here such a coincidence… Not thinking long we asked if we could go with him and just spend a day with the people they were looking for from almost 3 weeks. The decision, however, wasn’t up to him – so he had to call the head of the clan. View from the window while travelling to see First Nations. We got invited but we had to bring a gift. After a small suggestion (“I long for good cheese” the head of the clan said) we bought a 2.5 kg block of Gouda cheese and went for one of the most exciting adventures we’ve ever had. We passed Tadoussac and drove farther north. After another hour has passed and we were still driving, we started to seriously doubt if we really made the right decision… Finally, we arrived to the place – hidden in the woods, next to the river. Quiet and secluded place, a few kilometers from the closest village – definitely not meant to be a public place. Our first impression – “it looks like a campsite.” Everywhere pitched tents or trailers/RVs with garden chairs and tables. Then we noticed the faces of people there. Most of them looked exactly how we imagined the true Indians – black hair, dark skin, slightly slanted eyes and distinctive facial features. They were exotic for us, as we (tourists from Poland) were exotic for them. The most important person in the clan is its head, so we started the visit with the greetings. Jean – our driver – took his gift, told us to take the cheese and took us to the boss. We were warmly welcomed and asked for help the next day in building the lodge for the celebration. Of course we agreed, after all – it’s what we wanted to do! We had only one condition – no pictures and videos during our stay in the village. This is their privacy, life and tradition, so they didn’t want to share it with anyone from the outside, that wasn’t invited by them. 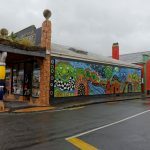 When we were leaving Benoit’s apartment in the morning we didn’t expect that – instead of a hostel in Tadoussac – we spend the night somewhere in the middle of the forest, in a village of Indians. We only had sleeping bags and some clothes, and nothing else – no tent, no food. We hoped for the hospitality of our hosts. And we were not disappointed. They invited us to one of the big tents, gave us something to eat, made some tea, and at night they lent us a mattress, so we had something soft to sleep on. 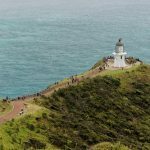 At the beginning we felt a bit uncomfortable – everyone around us spoke French and one of the few words that we understood was “merci” 🙂 However, there were some people who started a conversation in English with us. 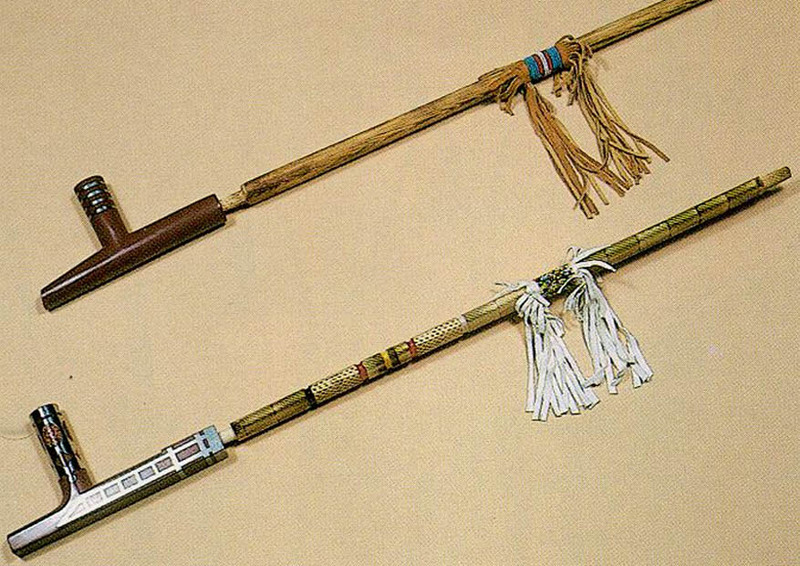 One of them was Buck – one of the tribal wise men. We spent that evening talking a lot – we told him about our trip, and he told us about his visit to Poland 30 years ago and many other trips which he took while he was teaching about the culture of the Indians of the Mi’kmaq tribe. 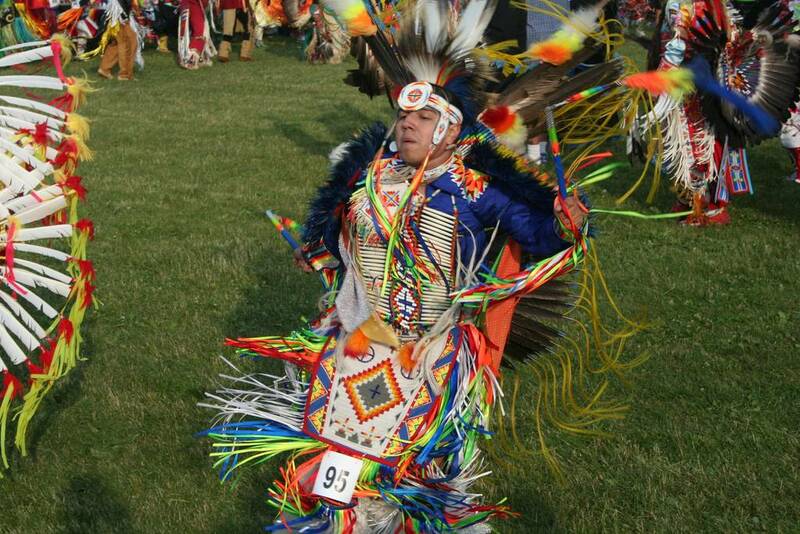 A man from Mi’kmaq tribe in traditional ceremonial clothes. We sat in a slightly dark tent filled with dense smoke from cigarettes, watching Buck leaning on his cane carved in the shape of a snake – there was something really magical in that sight. He said he carved the cane while he was young, thinking about the future times when he’ll need it. He also explained that the Snake in the beliefs of the Indians is the messenger of the Creator, who is secretly watching us and things we do. He continued to talk about the beliefs, symbols and customs of different tribes. He explained the differences between Indians known from movies and those who live in the Canadian forests. Also the fact that the feathers in Indian costumes are like a book, from which you can read who the person is and what she/he went through. We would probably be talking a lot longer if not for the fact that we all had to get up in the morning and finish building the lodge for the upcoming celebration. We woke up and had breakfast early in the morning, and just before 9:00 prepared accordingly to the rules – Patrycja wore a long skirt (borrowed by one of the women), and Dawid had a red bandana on his head (a gift from one of the wise men), we headed toward the place, where the lodge was to be set. 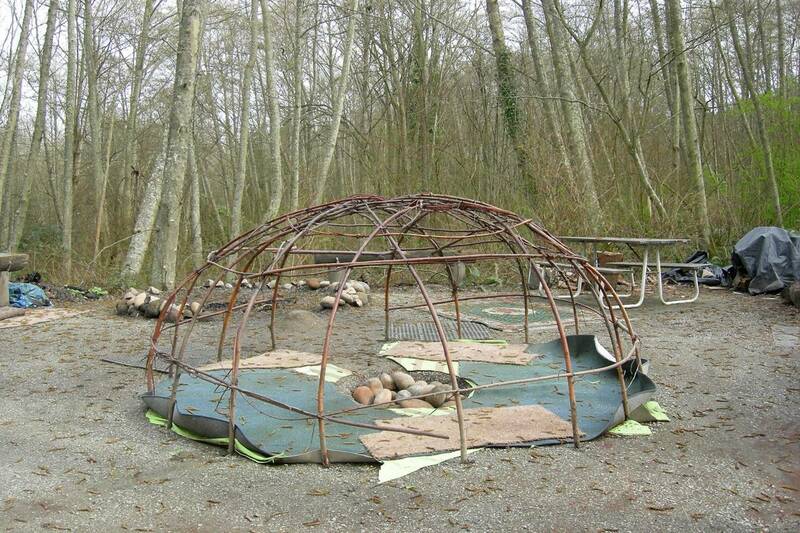 A sample First Nations lodge scaffold. Initially, Patrycja was supposed to go with other women to gather cypress branches in the forest, but Buck said, “You cannot go and decorate the house, not knowing how it was built… Let them both stay and build the lodge” – so we both stayed. Everybody had their job – men harder, women lighter – but we all worked together to help each other. The lodge we helped to build was around 100 meters long and 25 meters wide. During those few hours of working together we were often called by wise men sitting in the shade of trees and told about the culture, traditions and stages of the preparations for the celebration beginning the next day. During the works we met a lot of interesting people, we heard many interesting stories from the lives of Indians and learned more about their beliefs and the community. The day passed incredibly quickly. Some working, some chit-chating… “oh shoot, it’s time to go.” Although many people tried persuading us to stay for the celebrations (which were supposed to be 4 days long), but unfortunately we had already bought plane tickets to USA. 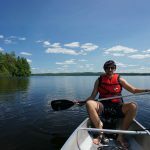 In less than 48 hours we had to travel more than 350 km to Quebec City and pack our things – and the only transportation we could count on was hitchhiking. 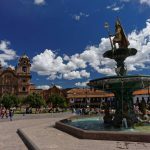 And although we had mixed feelings – to come back and catch the plane or to stay and lose tickets, but take part in celebration of the Indians, in this one point we decided to stick to the plan and we decided we’re going back. Buck said – “However, if you decide to go today, before leaving come to see me.” After packing all the things we went to say goodbye to all, and we started with Buck. He invited us to sit with him and said “You couldn’t take any photos, but you’ll get a souvenir.” He reached for his bag made of otter skin (the first animal he hunted in his life) he started unpacking things. 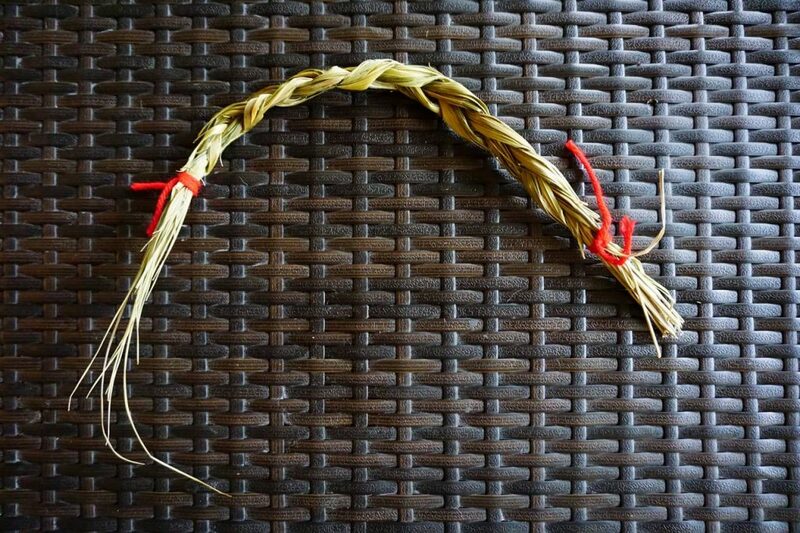 The first thing that we gave was sugar cane plait, which Indians hang over the entrance to the house or tent. It is meant to protect people from evil spirits and the smoke from firing it purifies the soul and body. Then he gave us osha root (Ligusticum Porteri), the so-called “bear root” that has a very intense aroma and spicy flavor. This plant has similar properties as coneflower (Echinacea purpurea) – stimulates immune system and has an antibacterial effect. According to Buck, chewing the root cleanses the body and opens the mind. Literally, a little bit was enough for intense bitter-spicy flavor to stay in our mouths for a long time. Then Buck took a hand-made colorful leather handbag from his bag. 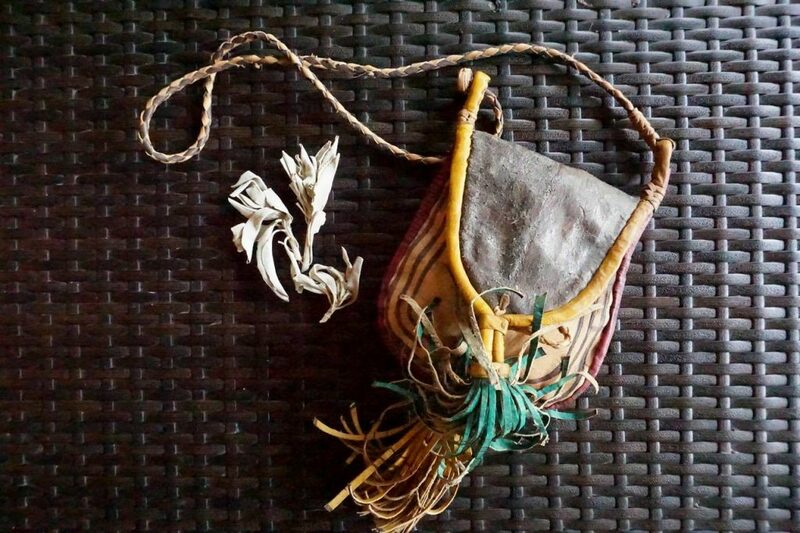 There was dried sage inside the purse. It was a gift for Patrycja as it’s primarily women that take cares of the health of the family. He also added that sage can be used both for medicinal purposes and to use smoke to purify the aura around us. 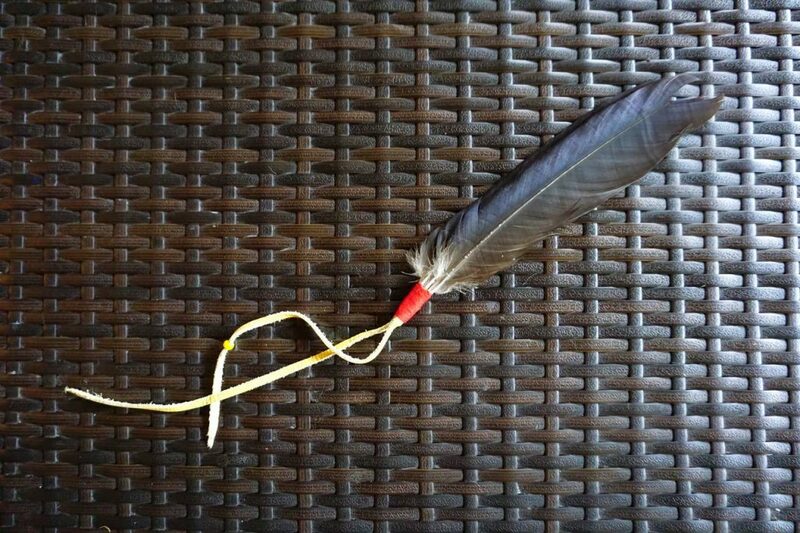 Dawid received three raven feathers bound together with a red string and a leather strap, which can be used to fan the smoke of burnt sage. After smoking the pipe we said goodbye to Buck and went to say goodbye to the people we spent most time with. The head of the clan said that if we ever wanted to visit them again, we are always welcome. We thanked for the hospitality, took our things and went on the road hitchhiking to Tadoussac. Natives in Canada can be divided into two groups. The first of them can be relatively easy to find because their reserves are open to tourists, they often have their own websites or make money posing for pictures while dressed in traditional clothes. The second group values their privacy, do not flaunt with their traditions, and to meet them, you have to know where to find them or know someone who will invite you to spend time in their village. If you would like to learn more about the indigenous people of Canada, lot of information can be found on the website Aboriginal Affairs and Northern Development Canada .